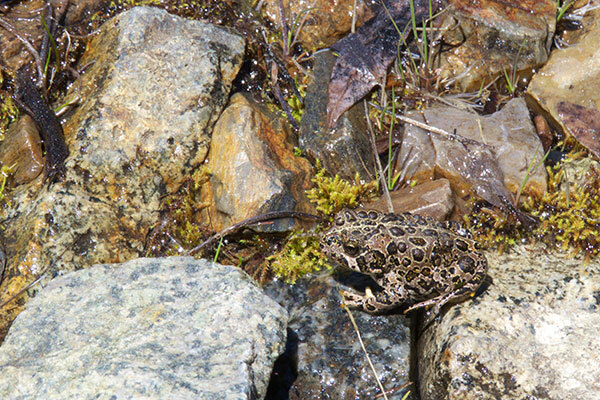 My wife and I and two of our dogs had nearly completed the circumnavigation of one of the many lakes in this part of the High Sierra when I saw this little fellow hopping along a part of the trail. Most of the trail had been dry, but this was one of the spots where water seeped down lake-ward. 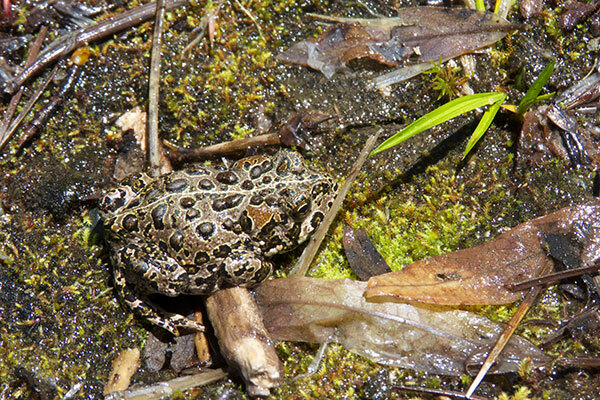 I hadn't been thinking about this species, one I had long wanted to see, and at first thought it was the much more widespread Western Toad. But when I got a closer look I noticed the unfamiliar orange-brown paratoid glands, and the well-defined light outlines around the large, dark warts, and I picked up interest. Later that day as we drove between parts of Yosemite National Park and Mono Lake, whenever we'd briefly have a cellphone data signal I searched for specific information that would help me ascertain whether I had in fact finally come across the threatened Yosemite Toad. I found a paper that described the decline of this species over the years in a number of specific locations, including the very lake where I found this one. So though I was happy to clarify the identification, it was depressing to consider how this is one of the many amphibian species whose populations have been drastically reduced in recent decades, and might not be around for much longer.